Today is about Blackout by Mira Grant! It’s the conclusion to Newsflesh, a science fiction/horror trilogy about blogging and the zombie apocalypse. 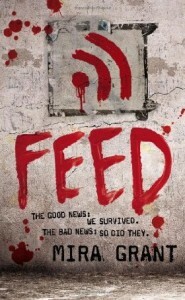 Even though I’m not normally a zombie fan, I really enjoyed the first book, Feed. It was dark with a great sense of humor and it had one of the most memorable endings I’ve ever read. To learn more about Mira Grant and her series, you can visit her website. If you’ve been following this blog for any length of time, you probably know I am also a HUGE fan of Mira Grant’s other identity as her actual self – urban fantasy writer Seanan McGuire. Her blog is pretty stellar too, particularly when she writes posts like this one about the digital divide. I don’t seem to be the only one who thinks pretty highly of her, either. Seanan McGuire won the 2010 John W. Campbell Award for Best New Writer, and both of the first two Newsflesh books (Feed and Deadline) have been nominated for the Hugo Awards. In fact, Seanan was nominated for a total of 4 Hugo Awards this year, making her the first woman to receive that many Hugo nominations in one year. 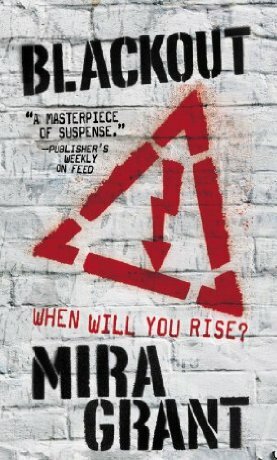 Now that you understand why Mira Grant is awesome incarnate, I have some super secret information for you regarding Blackout and a chance to win the entire trilogy! Once you’ve gathered all five codes, you can access the encrypted document at the Orbit Books site. 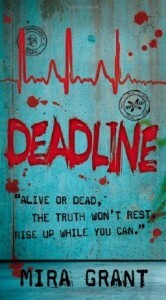 WARNING: Massive spoilers for Feed and Deadline ahead! …or, if you’re a little bit more patient and a little bit less willing to track down clues, you can take a shot a winning Feed, Deadline, and Blackout! 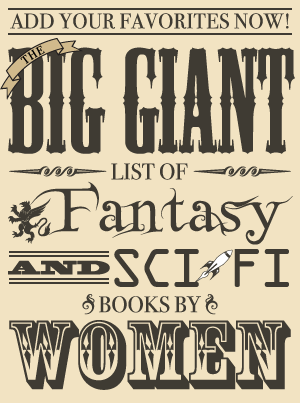 You may have noticed that, unlike the first two weeks of Women in SF&F Month, I didn’t have a giveaway last weekend. Instead, I figured I’d wait until the Blackout event to announce this one! Giveaway Rules: To be entered in the giveaway, fill out the form below. One entry per person and a winner will be randomly selected. This giveaway is open in the US, Canada, and the UK, and will be open until the end of the day on Wednesday, May 16. The winner has 24 hours to respond once contacted via email, and if I don’t hear from them by then a new winner will be chosen (who will also have 24 hours to respond until someone gets back to me with a place to send the book). The winner will be sent all three books following Blackout‘s release on May 22. Update: The form has been removed now that the giveaway is closed.